The Aspirus Heart & Vascular is one the first hospitals in Wisconsin to perform Transcatheter Aortic Valve Replacement (TAVR). This advanced cardiac procedure provides new hope for highly symptomatic aortic stenosis patients who at moderate or high-risk for surgery. What is Severe Aortic Stenosis? Severe aortic stenosis is a narrowing of your aortic valve opening that does not allow normal blood flow. It is most often caused by calcification of the valve in older patients. It can be caused by a birth defect, rheumatic fever, or radiation therapy, or can be related to age. Over time the leaflets become stiff, reducing their ability to fully open and close. Eventually the heart gets weaker increasing the risk of heart failure. How is Transcatheter Aortic Valve Replacement (TAVR) performed? The minimally invasive TAVR procedure involves guiding a collapsible aortic heart valve through the femoral artery in the thigh via a catheter(transfemoral procedure) into the heart or, through an incision between the ribs and then through the bottom end of the heart called the apex (transapical procedure), or via the subclavian artery or direct aortic for patients with challenged access with the traditional trans-femoral approach. Once it reaches the site of the diseased valve, the replacement valve is positioned and deployed across the patient's own narrowed valve. This is all done while the heart is still beating. 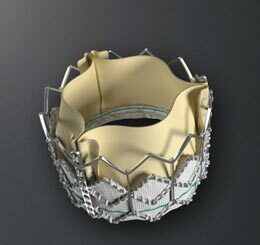 The Aspirus Heart & Vascular was the first hospital in Wisconsin to perform TAVR using the new transapical approach. Who is a TAVR Candidate? Transcatheter Aortic Valve Replacement is an option for patients with severe aortic stenosis, who are at moderate or high-risk with traditional open heart surgery or are at high-risk for surgey. Because TAVR is done without cardiopulmonary bypass it is most beneficial for high-risk older patients, or those who are too ill with other health problems. Patients must meet strict criteria to be qualified for TAVR. Eligibility screening starts with an evaluation by a team of cardiologists, surgeons, cardiac nurses and imaging specialists at the Valve Clinic. The TAVR qualification assessment also includes testing such as heart catheterization and a CT of the chest, abdomen & pelvis. Who Can I Talk To Find Out if TAVR is Right for Me? If you think you might be a qualified candidate for Transcatheter Aortic Valve Replacement (TAVR), please call the Valve Clinic at the Aspirus Heart & Vascular at 877.974.3571 or email us at valveclinic@aspirus.org. You will hear back from the Clinic nurse within one business day.